I don’t dream very often. Perhaps I do and simply don’t remember them. Perhaps my waking insanity is enough to satisfy my subconscious. I don’t really know how all that stuff works. But when I have a dream that I can actually recall, it’s something special. The dream I had last night went well beyond “special” and into a space where my slumbering mind seems to have written, cast, filmed, and produced the strangest episode of Mad Men to ever hit the brainwaves. Two girls flee a building and clamber into their car, trying to both escape and hide a stash of dope in the glove compartment before they get caught. They are not successful. A man appears beside the car and fires into it, killing them both. After he leans in and grabs the dope, he turns toward the camera. It’s none other than Don Draper. Flash back to happier, less murderous times. Don, Bert Cooper, and Peggy Olson are sitting in a plush office with an unidentified fourth character. Peggy has found a bottle of whiskey that’s been stashed away in the building for over forty years and is eager to crack it open. But it turns out Cooper already did the honors, much to her dismay. Still, a good-natured Don pours everyone a drink and raises a toast to Peggy and the newcomer, saying they’ll be taking over the company any time now. Peggy humbly brushes off the toast, while Cooper looks genuinely concerned about the prospect. The newcomer asks Don about a new electric razor that the veteran ad man just bought. Returning to the future, the building is in chaos. Gunmen have invaded and are taking out people left and right. As the newcomer desperately tries to escape and run to safety down Madison Avenue, he is hindered or helped by numerous players from Mad Men‘s past, a marching band, and a troupe of kids carrying cabers. Much of the main cast is struck down as the frantic flight draws to a close and the newcomer finds himself trapped in a warehouse with the supposed architect of the disaster. This man is not — as one might suspect — the suddenly-violent Draper, but only a lieutenant of his. And even though our newcomer has dodged all sorts of danger to get to this point, it seems that this man (curiously played by a Ghostbusters-era Harold Ramis) doesn’t want him dead. Instead, he has our newcomer open a wooden case, a package from Draper. Harold Ramis slings his machine gun over his back, lights a cigarette, and says “See ya around, kid,” before he casually strolls from the building. Opening the case, our man finds nothing other than the electric razor kit he had admired earlier. 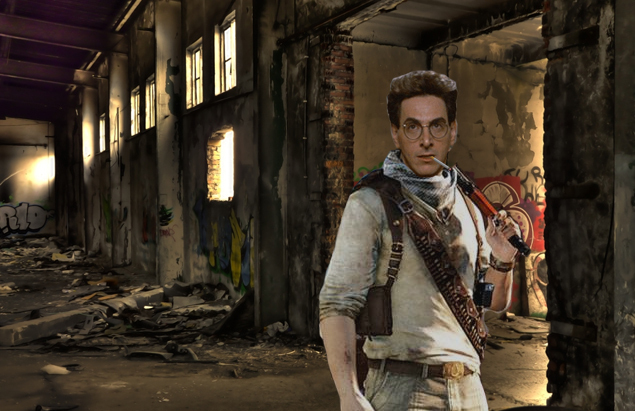 Apparently, my subconscious thinks Egon is a badass. This dream was especially extraordinary because it was cut just like a TV show, with familiar camera angles and the “end is the beginning” story structure that has come into fashion of late. Obviously, other than the flashback, it didn’t really feel like an episode of Mad Men in particular, but it certainly felt like I was watching television. I wish my mind had filled in more details as to why Don Draper turned to a life of murderous crime, or why he chose to orchestrate a massive spree of killing and destruction simply to give the mysterious new character a razor. Perhaps these would be questions answered over the course of the imaginary season. Mad Men‘s sixth real season won’t begin until April 7th, which makes me wonder if my brain is simply trying to handle the withdrawals by creating its own content. I admire the effort, but I have to say I don’t much care for the radical change in tone and direction my subconscious chose for the series. In other words, cerebrum: don’t quit your day job. Tags: Bert Cooper, Don Draper, dreams, Elisabeth Moss, Harold Ramis, Jon Hamm, Mad Men, Peggy Olson, television. Bookmark the permalink.